Designed using deep cell air technology for international use, the AME300 Mattress has 20 nylon-coated, 8-inch-high air cells to immerse and envelop the patient for optimal pressure redistribution. The AME300 Mattress also features a foam base for additional protection during power outages and is covered with a quilted Plexus® nylon top cover that reduces shear. 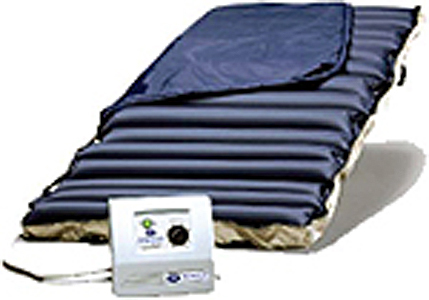 Complete with an easy to use AME300 Controller featuring a pressure selection dial control, the AME300 Mattress System is an ideal pressure management solution for home care and healthcare facilities. CPR quick-release for rapid deflation. Dimensions: 34"w x 76"l x 5"h.
Warranty: 2-yr limited on air controller and 1-yr on air mattress. There are currently no operating instructions for the AME300 Overlay.